A magnitude 8.8 earthquake struck Chile early Saturday, February 27, setting off tsunami warnings for Hawaii and the entire Pacific basin. The fifth most powerful earthquake since 1900 has already officially claimed 700 deaths and that number is rising. More than 1.5 million homes were destroyed or damaged. Coastal towns, including Constitucion, lost the center of their village. Chilean President, Michelle Bachelet, called the earthquake “an emergency unparalleled in the history of Chile” and ordered supermarkets to give away basic supplies to help desperate victims. The ground continues to shake with aftershocks; more than 50 followed the earthquake. 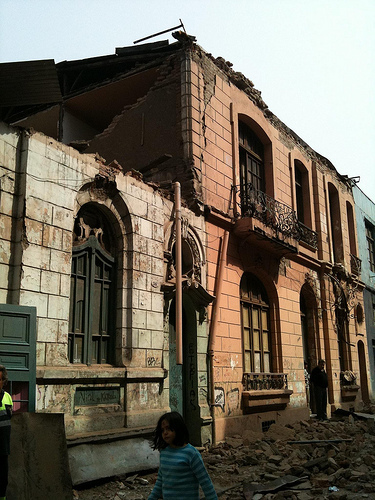 And despite the state-mandated, earthquake-resistant building standards that helped mitigate damage, Chile needs emergency relief help. Food, water and medical supplies are critical necessities as the Chilean government and aid groups search for survivors in the rubble. AmeriCares is sending medical supplies and humanitarian aid. The American Red Cross has made an initial pledge of $50,000 from their International Response Fund, which your donation can bolster. Convoy of Hope announced that teams are headed to Chile to assess damage, coordinate relief efforts and provide clean water. Direct Relief International has offered to provide medical aid to Chilean authorities and to emergency relief organizations in the area. Doctors Without Borders/Médecins San Frontières (MSF) is sending an exploratory team to assess medical needs. Habitat for Humanity Chile is already working on shelter solutions for low-income families affected by the earthquake. International Medical Corps is currently deploying resources to Chile. Operation USA is sending emergency relief for grassroots partners on the ground. Mercy Corps is collecting donations on behalf of local relief organizations in Chile. NESsT established the Levantando Chile Fund to support local Chilean nonprofit organizations channeling assistance to communities on the ground, and supporting both immediate relief efforts and long-term reconstruction efforts in Chile. Oxfam is sending water engineers and logisticians to assess the situation and is pledging to help local partners better complete their work. The Salvation Army mobilized immediately to provide food and supplies. Its international headquarters pledged financial assistance to support these efforts. Save The Children is sending an emergency assessment team. World Vision is in Chile handing out blankets and water containers to victims. …users of social media the world over have undertaken their own rescue measures. Twitter, Facebook, and several of Google’s properties aren’t trivial, now. They’re life-saving, informational tools. An eye-rolling bit of gossip about one of those Kardashian girls can explode through the Web in minutes–and now, news about those in Chile is traveling over the same digital pathways, with the same speed, reaching the same vast amount of people. Tell a friend and make a difference today! In response to the tragic events following the earthquake in Chile, NESsT established the Levantando Chile Fund to support local Chilean nonprofit organizations that are channeling assistance to communities on the ground. Levantando Chile is supporting both immediate relief efforts and long-term reconstruction efforts in Chile. Founded in Chile in 1999 by U.S. and Chilean Social Entrepreneurs Lee Davis and Nicole Etchart, NESsT has provided capital and mentoring to over 2,000 social enterprises, transforming thousands of lives and demonstrating entrepreneurial solutions to critical social problems across Latin America and Central Europe. Great to see entrepreneurial approaches to solving the challenges presented by the Chilean earthquake. We’re always interested in learning about other organizations making a difference on the ground and systemically in Chile, so if you’re a nonprofit and have a story to tell, let us know!